The Transportation Department is a big organization with a tall order: Provide the public with information and easy-to-use services from its range of agencies, which include the National Highway Traffic Safety Administration, Federal Railroad Administration, Research and Special Programs Administration, Maritime Administration and U.S. Coast Guard. To fill that order, the department, which has nearly 100,000 employees and an annual budget of $48 billion, has put access to those services in a single electronic-commerce Web site. 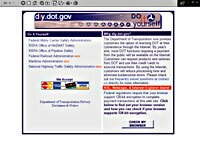 Using Oracle Corp.'s iStore e-commerce application, DOT is providing materials and services at diy.dot.gov. DIY stands for do it yourself. Transportation's DIY site, which uses Oracle Corp.'s iStore, offers a simple interface to a variety of services. The Oracle iStore uses an Oracle8 database and operates on a Sun Microsystems server running SunSoft Solaris. Customers at the DIY site can make payments with credit cards, just as at commercial sites. 'The ability to handle credit card transactions was fundamental to our plans for the site. A wholesale agreement with the Treasury Department paved the way,' said David Kleinberg, deputy chief financial officer for DOT. The department's use of iStore illustrates a way agencies can follow the commercial Web site model by 'productizing' their services'that is, treating the services and other functions on their site as though they were products. For example, it is possible to sign up for a variety of training courses at the Web site. In this case, each session of the course is considered a product, while each seat in the course is considered one item of that product. By limiting the number of items available for that product to the number of seats for the course, the size of each session can be regulated. It is also possible to pay fines at the site. Entering the case number for the fine specifies which product the customer is interested in'namely his own fine. By paying the fine online with a credit card, the case number is withdrawn from the inventory automatically, and paper processing is reduced. Motor carrier insurance payments work similarly. Each session of a DOT training course is, for the purposes of the site, treated as a product with a limited number available. The DIY site has none of the heavy-duty graphics or multimedia special effects you might see on commercial sites, the result of an intentional effort to ensure access to low-bandwidth users. 'We want people to be able to use this site whether they have a 14.4-Kbps modem or a T1 line,' said Kleinberg. Another reason is aesthetic: A simple site is what people expect from a government agency. As Kleinberg said, 'We don't want people thinking, 'Why are they wasting taxpayer money on this?' ' Such a low-graphics site immediately maximizes the potential audience for the site and makes it simpler to navigate for nonexpert visitors. DOT project managers said they wanted to avoid building a new bureaucracy to deal with the DIY site. They designed the site to resemble a department store, with different agencies responsible for their own departments, Kleinberg said. The site also serves as a gateway to DOT's main page and includes links to other pertinent sites as part of its one-stop shopping approach.